I was never a big fan of pancakes, as they often didn’t taste cooked in the middle. Waffles, on the other hand, have always been a favorite. 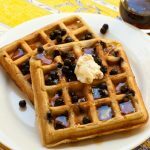 These gluten-free blueberry-oat waffles totally fill my waffle cravings and the batter comes together quickly in a blender. You have to make your own waffles if you are gluten-free. If you are watching your sugar or sodium intake, these can also be modified. The great thing about this recipe is how adaptable it is. The original recipe is from a long-gone wafflemaker pamphlet. Leftover waffles go in the freezer; you can pop them into the toaster for a quick breakfast. If you make up a batch of savory waffles, those can stand in for bread to make quick sandwiches or open-face melts. The renovation: I substituted soy milk or skim for regular milk, a gluten-free flour mix for the flour, and agave syrup for the small amount of sugar in the original. The trick to using blueberries is to drop them into the batter as you are cooking them, otherwise they bleed and turn the waffles an unappetizing color. Make these into apple-cinnamon waffles by adding 1 teaspoon cinnamon to the batter, then stirring in two finely diced peeled and cored apples. Blend up a batch of gluten-free blueberry oat waffles, making the batter in the blender. Tender and perfect every time! If using rolled oats (or flax seed), put them in the dry blender and pulse until finely ground. Dump them out into a bowl. Put the next five ingredients into the blender and pulse a few times until well blended. Add the flour, oats, and salt and pulse just until well mixed. Let stand a few minutes to thicken. If not using egg, add 1 T. (5 g) ground flaxseed (or chia seeds) plus 3 T. (45 ml) filtered water as the egg replacer. Let stand five minutes in the blender before adding the rest of the ingredients. Add additional milk if needed to create a pourable batter. Spray both surfaces of the waffle iron with cooking spray. Add the blueberries on top of each waffle before baking. Follow the instructions for filling and baking your waffle iron, being careful to spray the iron each time with cooking spray. Blueberries will tend to stick and burn. Don't overfill. Cook for about 5 minutes until golden brown and crispy. Serve with a small amount of heart-healthy margarine or grass-fed unsalted butter, maple syrup, and additional blueberries. Diabetics can substitute a small amount of agave syrup instead of maple syrup, focusing more on the fresh fruit. You can also add a single egg on the side for protein, to keep your blood glucose level balanced. 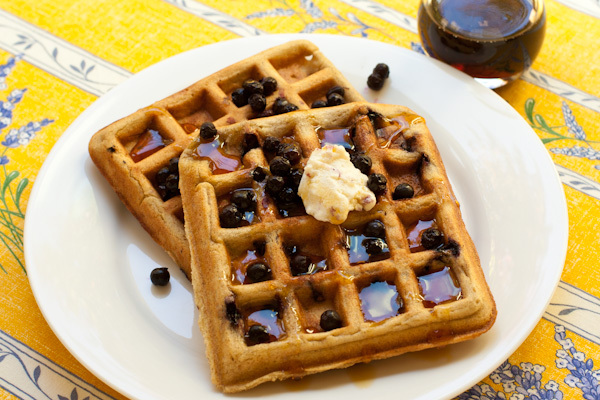 For savory waffles: Omit the sugar and berries, and add corn meal or buckwheat flour instead of the oats.